Back in November of 2016, I was super thrilled to introduce our founding author Shelly Roark to you all. She is the first author to publish with Little Lamb Books, and I wrote a short introduction about her and the theme of her picture book, The Bubble Who Would Not POP! … and then we went to work. We searched and found an experienced editor…the amazingly wise Amy Betz. We searched and found a HUGELY talented illustrator, who grabbed our concept from the beginning…Simone Krüger is simply AMAZING! We searched and found a printer in the USA…Jostens ROCKS! We searched and found a book design company that we share much in common with…the lovely TLC Graphics. We searched and found a strong distributor in the nationally-known Small Press United. If you are a vendor, who would like to sell our books, you can contact them. Y’all, it takes a very large village! Then, we planned, edited, illustrated, crafted, tweaked, and edited and planned some more. And, of course, we prayed. We prayed for wisdom, discernment, provision, creativity, vision, and peace. 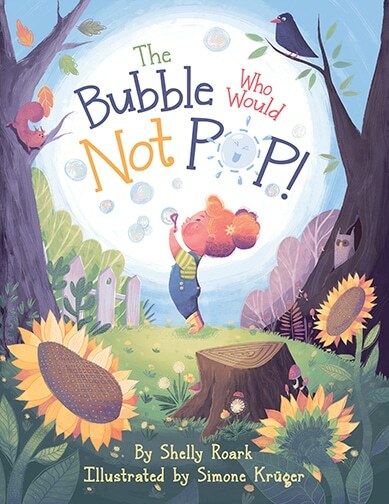 And, this week we are so proud to reveal the cover of our debut children’s picture book, The Bubble Who Would Not POP! written by Shelly Roark and illustrated by Simone Krüger. Here’s what it’s all about: Billy Bubble is ready to burst! The excitement of finally being out of his bottle on a beautiful, sunny day is everything he’s hoped for. But someone else has bigger plans for Billy. The green-eyed girl with the bubble wand has a special message that needs to get to heaven pronto. Billy’s secret mission through the dangers of the sky – pointy branches, bird beaks, oh my! – will bring him before God, where he’ll learn an important lesson about God’s love and compassion. Join Billy Bubble on his journey of faith, and discover the power of prayer for yourself using the helpful prayer journal in the back of this book! Keep track of your prayers and see how God answers each of them as we live our lives for Him. Our Heavenly Father knows every hair on our heads, every bubble in the sky, and every prayer we offer with a sincere heart. Y’all this beautiful, amazing, colorful picture book is everything we dreamed it would be and more. It will release to the world on Tuesday, September 12, 2017 (that’s less than two months away! ), but guess what?! You can go ahead and pre-order The Bubble Who Would Not POP! on Amazon today…right now…this instant! Just click the link and it will take you to the correct page and YOU can pre-order as many copies as you like for yourself, your friends, your school libraries, your extended family…EVERYONE! And, then on September 12, your book will be shipped your direction! We have loads of folks behind-the-scenes (Amy M, Tamara D, Erin, Tom, Tread, etc.) to thank for helping us bring Billy the Bubble to life, but mostly, I’m so thankful that Shelly chose to partner with Little Lamb Books as her publishing house. I’m beyond thankful to our Heavenly Father for bringing us a beautiful and wonderful first author and sweet story. I’m blessed beyond measure with a team I enjoyed working with on this book and on each book that is coming (Yep, there’s more. Get ready!). God is going to do amazing and big things for us in 2018, and we can’t wait! But, today. Well, today is all about the celebration going on with and for Shelly and The Bubble Who Would Not POP! Happy Cover Reveal Week Shelly…and Billy Bubble! WOOHOOOO! AmazonBill the Bubbleblessedchildren's picture bookcover revealdebut picture bookeditGodillustrationsJostensJulypicture bookplanpre-orderShelly RoarkSimonethankfulThe Bubble Who Would Not POP!